Wow, feels great to finally start this thread, and this project! It is ugly, but mechanically sound. The motor is strong. I can't wait to tear into it! Picked it up today. It is a '61, so no emmisions testing (whew). It is the oldest car I have ever owned, interestingly...here are the specs. 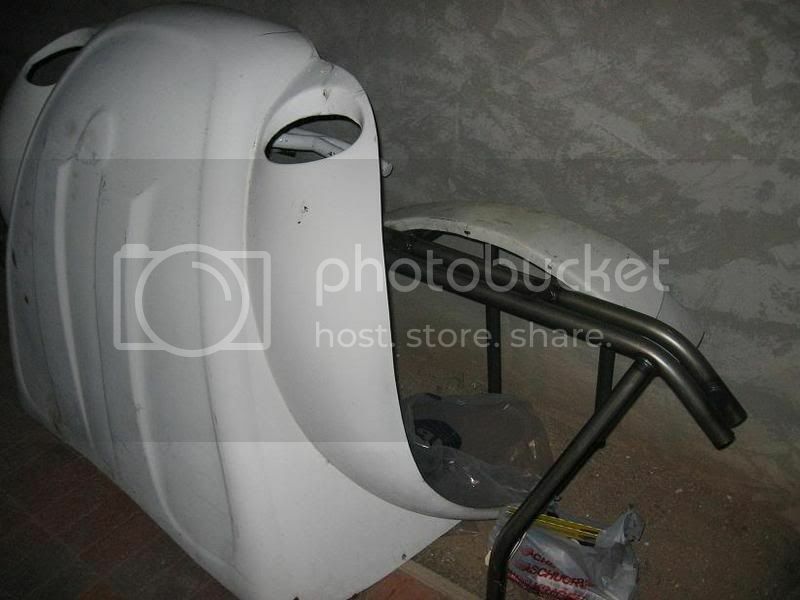 -Half-assed front baja conversion, (all going away for a 1 piece fiberglas front) I will be selling the front and rear fenders, they are nice, but I don't need them. Those nerf bars need to go! 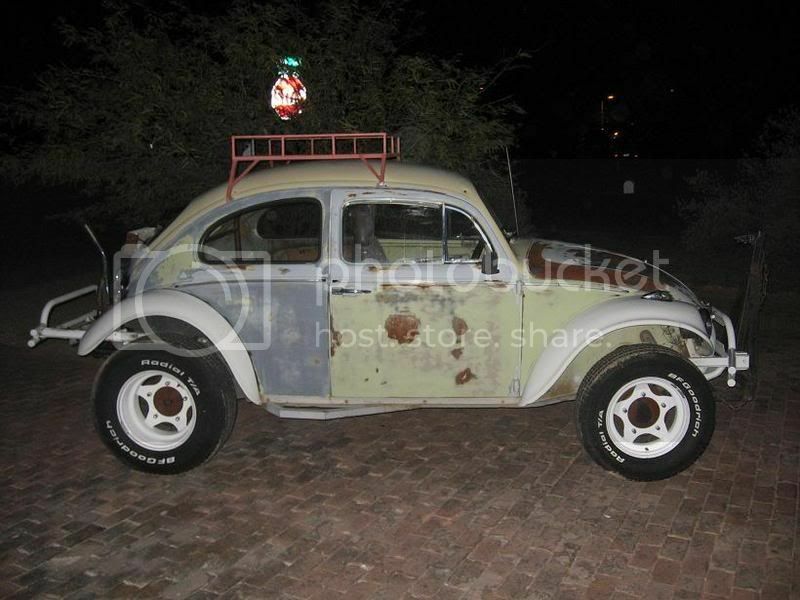 -Roof rack, but I will likely sell that. It is really nice, actually, but I don't like roof racks. -6 point cage, nicely done with gusseting...good base cage to build on. -IRS with type 1 Transaxle, new stub axles and CV joints. -Dual shocks in rear, but rigged poorly. 3X# arms to follow. -Solid trans mount, and both trans straps. -1600 DP, .009, electronic ignition, Empi 1 5/8 stinger, alternator conv.,full flow oil setup with cooler and dual filters, and some other crap I don't remember! Take a look, but I promise in a week you will not recognize it as the same car! $1500...I think I did just fine. GREAT START DITCH,,WOW SOMEBODY TOOK SOME TIME TO CUT THE FRONT HOOD LIKE THAT,, WAY TO GO! !61,S ARE COOL!! Looks like another old baja will be reconstructed into a worthy machine. Sounds like you're on the right track. Sounds like you got a pretty good buy, too. I started with much less than that! Cool Baja! Keep the pics coming. On a side note, I went to Chirco yesterday morning to pick up a rail frame. On the way back (about 9:30 or so) I was cruisin down the oracle highway and I pull up behind this red and silver chevy pickup, and whats in the back? The Harley you just sold. Now what are the chances? Im sure it was the bike because I pulled up beside him and the red arrow sticker was on the forks. The guy who bought it is from Globe, that's where he was headed. I took that route last night towing this car down from Apache Junction, and passes the light blue baja with the graphics on the side that is on craigslist...man, that thing was LOUD! Looks like a GREAT start, and a smokin' deal you got on it to boot. Welcome to the ranks of EARLY model baja owners! 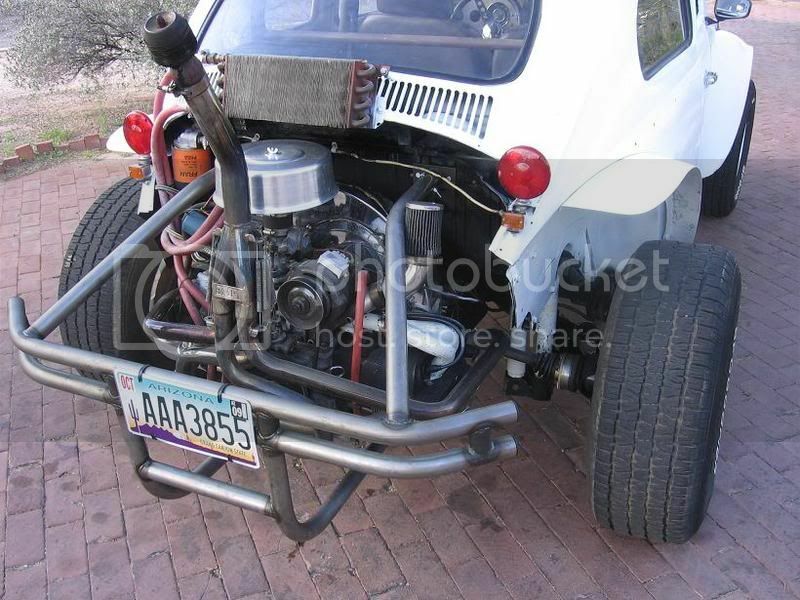 Trip to Chirco yielded a double tube rear bumper, light buckets, another set of taillights, and weld on tabs for them. On the way home, I picked up the one piece front end T_Town Baja found for me on craigslist. 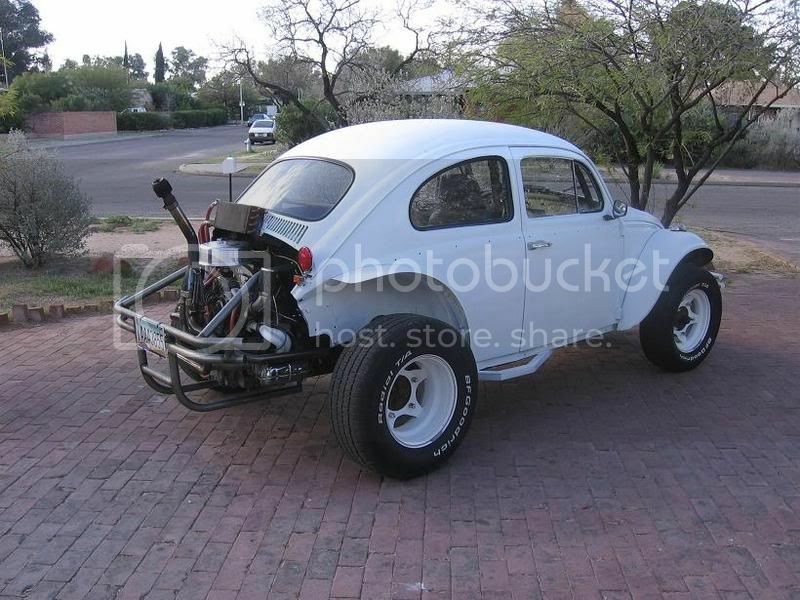 The guy had that and one of those whaletail rear fenders, which I did not want. I ended up getting the front end, and some cool cut back racing fenders from the guy for $85 total! 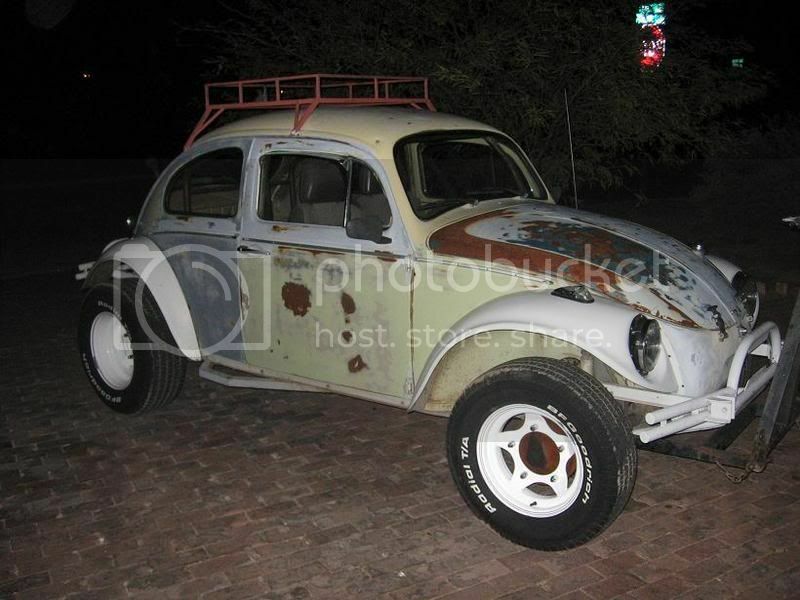 By the way, the car the parts were from is a '55 baja...if anyone needs parts, I'll hook you up. Mostly residue, but there are doors, etc. Wife: "Why is there a big car part tied to the roof rack of my van?" Me: "Because that is the only place it would fit." Well on my way. I also bought sandpaper and white primer...by the time the weekend is over, it will look like another car. Today I made it (mostly) all one color - white. It will someday be a body-off -pan redo, but just to drive it around now, I want it all the same color. So, 8 rattle cans later, it is sort of. 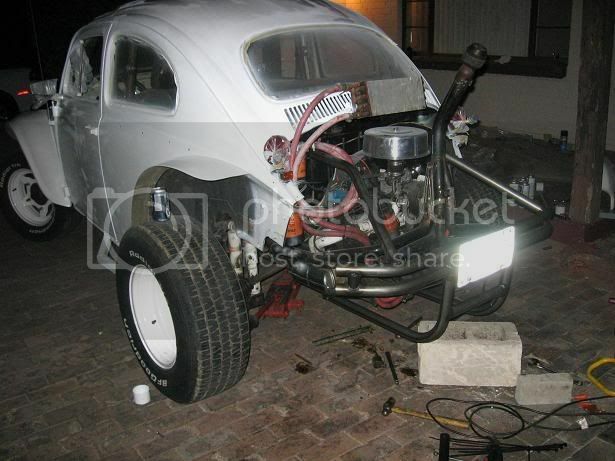 I took off the old huge rear fenders, and bolted on the cutback fiberglas ones. Looks much better. I got about 3/4 through installing the engine cage. It really needs to be tied into the cage. That will come soon. Next is painting the front bumper, removing the ginormous towbar mount thing, and more cleaning and painting. Then, a trip to the power wash with Mr. foamy engine brite in hand. Here are some crappy pics, but it does look much better, I think. I like the engine cage. It is now registered and legal to roll! Yes, and a full flow setup, and a cooler. I'm not totally happy with the mounting setup, but I'll change it soon enough. what site did you purchase this from? Amazing how a car painted all one color looks so much better!!! looks good for the short amount of time you spent on it. Thanks. I have been driving it around, it runs and drives great. I cleaned it up a little, got the overspray off, and went to the power washer. The engine looks great. I really did get a better deal than I thought. I found it on the Samba, and called the very same day it appeared. 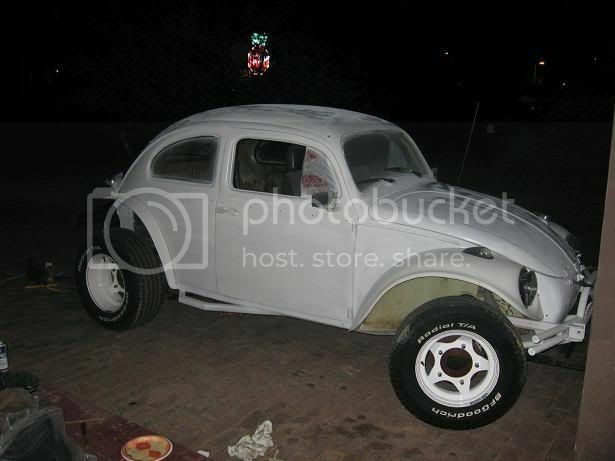 I decided on silver for the roll cage and bumpers, etc....and white for the interior also. I need a set of cheap poly buckets, and a poly rear seat. Also 7.00 x 15 aggresive tires up front, but Chirco is out of them for the forseeable future. Next big projects are more preload on the rear torsion bars for ride height, and getting that one piece front on there.